In the 2010 presidential election, Yanukovych became Yushchenko's successor as Ukrainian President after the Central Election Commission and international observers declared that the presidential election was conducted fairly. Yanukovych was ousted from power four years later following the February 2014 Euromaidan clashes in Kiev's Independence Square. Unlike the bloodless Orange Revolution, these protests resulted in more than 100 deaths, occurring mostly between 18 and 20 February 2014. The Ukrainian regime that was in power before the Orange Revolution created a path for a democratic society to emerge. It was based on a "competitive authoritarian regime" that is considered a "hybrid regime", allowing for a democracy and market economy to come to life. The election fraud definitely emphasised the Ukrainian citizens' desire for a more pluralistic type of government. The Cassette Scandal definitely sparked the public's desire to create a social reform movement. It not only undermined the peoples' respect for Kuchma as a president, but also for the elite ruling class in general. Because of Kuchma's scandalous behaviour, he lost many of his supporters with high ranking government positions. Many of the government officials who were on his side went on to fully support the election campaign of Yushchenko and well as his ideas in general. After a clear lack of faith in the government had been instilled in the Ukrainian population, Yushchenko's role had never been more important to the revolution. Yushchenko was a charismatic candidate who showed no signs of being corrupt. Yuschenko was on the same level as his constituents and presented his ideas in a "non-Soviet" way. 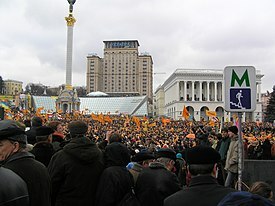 Young Ukrainian voters were extremely important to the outcome of the 2004 Presidential election. This new wave of younger people had different views of the main figures in Ukraine. They were exposed to a lot of negativity from the Kuchmagate and therefore had very skewed visions about Kuchma and his ability to lead their country. The abundance of younger people who participated showed an increasing sense of nationalism that was developing in the country. The Orange Revolution had enough popular impact that it interested people of all ages. In 2017, in "The Putin interviews" with the Director Oliver Stone, the Russian president Vladimir Putin said that the people's disagreement with the election results appeared to be genuine, but the subsequent riots were supported by U.S.intervention which led to them getting excerbated. The election took place in a highly charged atmosphere, with the Yanukovych team and the outgoing president's administration using their control of the government and state apparatus for intimidation of Yushchenko and his supporters. In September 2004 Yushchenko suffered dioxin poisoning under mysterious circumstances. While he survived and returned to the campaign trail, the poisoning undermined his health and altered his appearance dramatically (his face remains disfigured by the consequences to this day[update]). ^ On 6 November 2013 Pora! had organised the first tent camp in Kiev. ^ During a January 2013 debate in the Russian State Duma on a bill criminalising gay "propaganda" in Russia the A Just Russia deputy Oleg Nilov referred to "different personalities in some sort of orange or bright shorts". Former fellow Russian politician Sergey Glazyev stated in August 2013 that "a whole generation of diplomats and bureaucrats has appeared after the years of the 'orange' hysteria, who are carrying out an anti-Russian agenda" "creates an effect that Ukraine doesn't want", namely Ukrainian integration into the European Union and not into the Customs Union of Belarus, Kazakhstan and Russia. ^ Writing about the 2016 US presidential election Izvestia claimed "If the war-like, Russia-hating Hillary Clinton wins the US election, a third front could open up in the Caucasus; money will pour in to support terrorists, just like it did during the two Chechen wars. There could even be a fourth front in Central Asia, where weak regimes are already being attacked by extremists and 'Orange Revolutions'." ^ Andrew Wilson, "Ukraine's 'Orange Revolution' of 2004: The Paradoxes of Negotiation", in Adam Roberts and Timothy Garton Ash (eds. ), Civil Resistance and Power Politics: The Experience of Non-violent Action from Gandhi to the Present, Oxford University Press, 2009, pp. 295–316. ^ Polityuk, Pavel; Balmforth, Richard (15 February 2010). "Yanukovich declared winner in Ukraine poll". The Independent. London. ^ BBC News. "Ukraine Country Profile." 2012. http://news.bbc.co.uk/2/hi/europe/country_profiles/1102303.stm. 2 Dec 2012; Encyclopædia Britannica. Kuchma's Presidency. ; The Economist. "Catching Kuchma". 2011. http://www.economist.com/node/18488564. 3 Dec 2012.; Konieczna, Joanna. "The Orange Revolution in Ukraine. An Attempt to Understand the Reasons." 2005. http://www.osw.waw.pl/en/publikacje/osw-studies/2005-07-13/orange-revolution-ukraine-attempt-to-understand-reasons. 3 Dec 2012; Kuzio, Taras. Eight Necessary Factors for the Orange Revolution. ; Kuzio, Taras. Five Contributing Factors. ^ For question on ultimate source of orders and mobilisation details see Lehrke, Jesse Paul. The Transition to National Armies in the Former Soviet Republics, 1988–2005." Oxfordshire, UK: Routledge (2013), 188–89. ^ "How Yanukovych Forged the Elections. Headquarters' Telephone Talks Intercepted". Archived from the original on 23 December 2005. Retrieved 7 April 2014. CS1 maint: BOT: original-url status unknown (link), Ukrainska Pravda, 24 November 2004.